This post is partially inspired by the eternal complaining about "censorship" and localization, and partially by this article about Vagrant Story's localization. 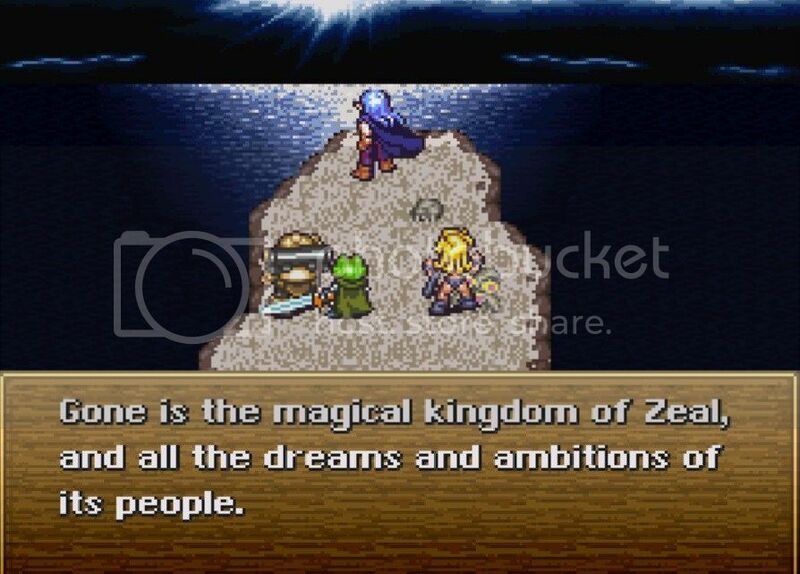 One of my favorite games of all time is Chrono Trigger, and my favorite part of Chrono Trigger is the Kingdom of Zeal, where dreams come true. It's the lynchpin of the game, the only part that isn't inspired by a historical era, and the most overtly fantastical. The Enlightened live on a floating continent above the clouds and away from the ice age below, using their magic to create a post-scarcity society and leaving their Earthbound cousins without magic to fend for themselves on the ground below. With the goal of surpassing even those limits and ensuring the eternal glory of the Kingdom of Zeal, they build a great machine. In Japanese, this is just the 魔神器 (majinki, "Demonic vessel"), which is awful. For one, it gives the game away immediately and lets the player know that the Kingdom of Zeal is corrupted. For another, it's silly. No one thinks that they're evil, and the people in Zeal who mention the majinki talk about it as a means to attain greater power for helping Zeal, but with a name like that, how believable is that? Why would anyone name the machine designed to power their society the "demonic vessel"? It's possible to read it slightly differently, as 魔・神器 instead of 魔神・器, but that just means "evil sacred treasure," which isn't any better. In English, the majinki was localized as the "Mammon Machine," which is a fantastic name. It's alliterative and slightly ominous, but doesn't immediately make you wonder why all these people are okay with a demonic vessel powering their society. The people in Kajar and Enhasa spend their time in magical research or idle dreaming in their utopia, fed by cornucopia machines and with magic to do all the work, and talk idly about how the Mammon Machine will make their kingdom even greater, and it sounds a bit strange. And then you get to the Zeal Palace, and this music starts playing, and you know something is very wrong with the Kingdom of Zeal. 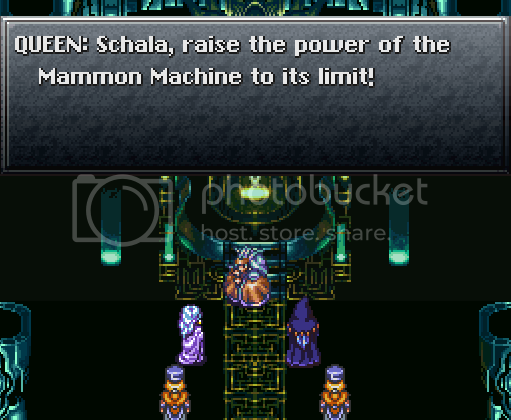 "The Earthbound Ones are being allowed to work on the construction of the Palace. So they do have a purpose after all." But it's not directly build on the suffering of others, just on social exclusion, which is at least marginally better than active oppression. The Kingdom of Zeal had everything they could want, but in their pride and greed they wanted more. So pushed on by their Queen, they reached out to the power slumbering beneath the ocean, and they built a machine to tap into that power to push them beyond their already lofty place. And because of it, they lost everything. Much more evocative than the "demonic vessel." A localization isn't a literally translation, and it shouldn't be, because sometimes it adds something that the original was missing. It's been a while! Various things came up, we had packed weekends, softlykarou was gone for a retreat, she made me a tasty olive oil cake with no chocolate whatsoever--yes, I do sometimes eat desserts that contain no chocolate at all!--we had a Call of Cthulhu game...you know, things. But this weekend we didn't have much to do other than one thing that I'll probably also write about tomorrow, and so I took down some chocolate from our supply, opened it up, and we tried it. I should have skipped another week.